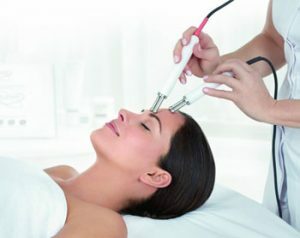 Discover how our professional high potency ACTIVES, ELEMIS' unique Skin Lift TOUCH and science of 5 in 1 advanced bio-electric TECHNOLOGY work in perfect synergy with the skin's natural bio-electric field. We offer a wide range of Elemis Biotec Facials, please contact us for more details. Super-lighting facial to help firm and tighten cheeks, neck and jawline. Skin is infused and stimulated by the contouring benefits of the Lift Effect Activator, rich in revolutionary plant stem cells and Lupin. Microcurrent pulses with Arjuna extract and Amber dramatically help lift and firm the sagging jowl area, whilst galvanic current propels bio-active formulas deeper into the skin.